Caher Island is located six miles southwest of Roonagh Pier. It was the site of an early Christian monastic settlement (around the 6th and seventh centuries A.D.). St. Patrick is said to have spent some time there after his fast on top of Croagh Patrick. A flat stone at the southeast gable of the little ruined oratory on Caher is named "Leaba Phádraic" in his honour. Caher Island is not currently inhabited. It is grazed by sheep from the nearby island of Inishturk. 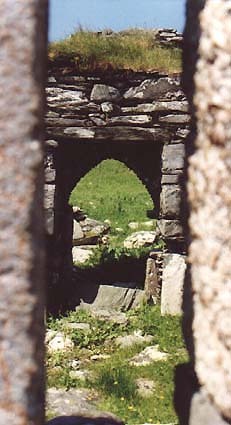 Looking northeast through the window of the monk's chapel . The following article was copied from the parish magazine, "An Choinneal", with permission from Rev. Leo Morahan of Louisburgh town. The author, Fr. Pat Prendergast, was born in Accony village and is buried beside the church at Leenane, where he served as Parish Priest at the time of his death. It was on a glorious June day – the I8th to be, exact - that I first visited Caher lsland, and as soon as I saw the ruins of the tiny chapel with the remains of the altar table, still discernible inside the east window, the thought immediately occurred to me that I would like to say Mass on that altar some day. The sight of the ruins, and especially of the many carved stones to which I shall refer later, could not fail to make an immediate, impression on anyone who has the slightest acquaintance with the remains of early Irish Christianity. In my case this impression was greatly strengthened by stories I had heard about the island from as far back as I can remember. Had not Saint Patrick himself visited it and established the monastic settlement whose ruins are still there? Do not all seamen who pass by it lower their sails in salute and, blessing themselves, invoke the intercession of Saint Patrick and Saint Brigid? Have not remarkable favours been granted to those who did the stations there? On the natural plane, too, its very remoteness, peaceful air and almost "otherworldliness” all added their appeal. Finally, to bring the matter right home to myself, there was the enthusiastic devotion of Aunt Annie to the stations on Caher which she had promised more than once in times of worries and fulfilled later when her requests had been granted. All these considerations built up a strong determination in my mind to get the necessary permission whenever a suitable opportunity should present itself. So matters rested till the proclamation of the Patrician Year, in 1961, by the Irish bishops. The traditionally accepted connection of Saint Patrick with Caher gave me a good reason for asking the Archbishop for permission – by a happy coincidence it was on the occasion of Confirmation on Inishbofin - and it was readily and graciously given in July 1961. The problem now was to find suitable weather for the pilgrimage venture. There is no pier on the island which, of course, is uninhabited and has been for as far back as memory or records go. To land a large number of people in safety it is necessary that the weather be settled, with a calm sea and very little wind, especially from the south. On more than one occasion I could have gone with a few able-bodied boatmen and landed and said Mass at short notice but I did not wish to disappoint the very many people, some of them elderly, whom I knew to be most anxious to share such an experience. During the whole of that summer the weather was very poor. It never really settled to the extent of giving three fine days in succession. Finally however, in late August the weather improved, and we fixed on August 31 as the day for making the attempt. On the previous evening we notified boatmen in Bofin, Inishturk and Clare Island and also in the Renvyle area of Connemara. Chris O'Grady of Clare Island was to pick up the group from Kilgeever parish at Roonagh. But first he was to check with the Inishturk boatmen as soon as the phone was open on the following morning. As they were the experts on the conditions around Caher, the final, decision was to rest with them. In the parlance of Cape Canaveral the final countdown had begun! On the following morning conditions still looked promising to us landsmen, but the news from Inishturk was disappointing. A southerly wind had sprung up and a swell was running sufficiently strong to make the landing of a large number rather risky. Determined to take no risks, sadly and reluctantly we sent telegrams and phone messages to all concerned and decided to wait for another day. As the year had already advanced and several people who were interested or directly involved had gone back to work, we decided to wait for another year. We were determined however to make the attempt as early as we could find suitable weather in the following year. Our opportunity came in Easter week. On Thursday the sea was flat calm and the weather forecast was good. It was actually as late as six o'clock on that evening that we took the decision to make the attempt on Friday. Messages were again sent to all interested parties and Chris O'Grady was alerted as before. On Friday morning there was a slight drizzle on the sea and over the island, though inland it was dry but dull. We contacted Clare Island about nine o'clock, and the news was good. The final decision was taken and we decided to leave about ten-thirty. Actually it was eleven before we set out from Roonagh, for at the last moment we discovered that we had no camera and we really wanted to have some pictorial record of the occasion. Our great regret was that we had no movie camera but, as explained above, the decision to go had to be taken and carried out at very short notice. We had twenty-seven people on board that morning as we sailed out from Roonagh. There were six priests among the group, namely, Father Gleeson of Clare Island, Father Jennings of Louisburgh, Fathers O'Malley and Shannon of Castlebar, Father Durkin of Saint Jarlath's and myself. The journey took us about an hour. As we rounded the south-east corner of the island which is called Kinkeel, we could see to the south the boat, The Southern Cross, skippered by John Concannon, bringing the Bofin contingent. Soon several currachs with outboard engines were chugging their way from Inishturk. John Lyons had taken his currach in tow from Roonagh and with this we started to disembark our group. The arrival of the other currachs helped to speed up this operation. Those of us who had gone ashore first had got the altar ready, and by twelve-thirty we were ready to start Mass. Meantime several of the pilgrims had gone to confession, and so they had the joy and privilege of receiving Holy Communion at the Mass. I shall digress for a moment to say a word about the ruins of the little chapel. It is quite small like many other chapels of the early Irish Christian period, measuring about fifteen feet by ten. Roofless now, it is made of coarse masonry with a low western door; and an eastern window which is a very narrow slit on the outside but much wider on the inside. According to the best archaeological opinion (cf. below) only the lowest part of the walls of the chapel dates from the early Christian period, the rest of it dating from the fifteenth century. Under what circumstances it was restored or rebuilt we have no way of knowing. Perhaps it marks the re-establishment of inhabitants on the island after centuries of abandonment. It is possible that some religiouscommunity was started again, though this is less likely to have gone unrecorded. At any rate we were conscious, as the Mass was about to commence, that this was probably the first Mass on the island for five centuries and possibly for thirteen. We felt linked in spiritual bonds to our countrymen of the late middle ages who used the little chapel, and beyond that to the monks of the sixth and seventh centuries who lived and prayed and offered Mass here, and back to our great Apostle himself whose holy mountain stood out clear and unmistakable on the mainland to the northeast. As the people of Inishturk had not yet put their cattle on for the summer grazing the only living things on the island were the sheep, their lambs and the birds. Some of the group sang sacred music during the Mass, unaccompanied except for the bleating of lambs, the songs of birds and the ever-present though gentle murmur of the sea. One would be very phlegmatic indeed if one failed to be moved by such an experience, and some declared that they felt as near to heaven as they ever hope to feel in this life. My Mass was followed by a Mass celebrated by Father Durkin who had got permission independently of me and quite unknown to me. Afterwards we all had an al fresco meal and then we performed the traditional stations. As these have been described in some detail by Father Durkin in an article in an earlier number of this magazine [An Choinneall, Number One, 1959] I shall not describe them beyond saying that at the final station at Tobermurray we made a small departure from the traditional practice of doing the rounds here on the bare knees. As our group numbered upwards of fifty we decided that it would be long and awkward for such a large number so we compromised and went around on our bare feet instead. 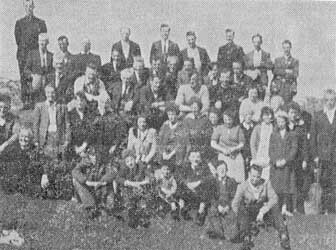 The 1961 pilgrims. The author is seated at the left of the picture. From the time we landed on the island - at noon - till we left at about four p.m. the weather was improving and the sun gettinghotter. As this was the first long exposure to the sun that most of us had got that year, it was possible during the days that followed to pick out the pilgrims by their sunburned faces! We were back at Roonagh about five, tired but spiritually uplifted and very conscious that we had shared a very rare and moving experience. Some had made the pilgrimage in thanksgiving for favours received, others for future favours, but all included in their prayers the safety of all the brave seamen who traverse the western waters around hallowed and historic Caher. When word of the accomplished pilgrimage got about in the days that followed there were so many expressions of regret from those who would have wished to participate that I am convinced that if we could have organized the pilgrimage with sufficient notice and publicity all the boats on mainland and island between Clew Bay and Galway Bay would hardly be sufficient to bring all who would want to be numbered among the pilgrims. We now turn from our pilgrimage to consider the antiquities of Caher. Many of our readers will have read the article referred to above in which Father Durkin gives a description of the size, situation, topography and modern history of the island. Taking all this for granted we shall consider its ancient history in so far as this can be deduced from a study of the buildings and carved stones that remain. In this we shall follow the account given by the French lady archaeologist, Francoise Henry, who made two visits to the island, the first in June 1939 and: the second in August 1947. She published her findings in the Journal of the Royal Society of Antiquaries of Ireland under the date July 1947. This article with photographs, diagrams and maps was reprinted in pamphlet form but it is now, regrettably, out of print. Miss Henry is now  a lecturer in archaeology in University College Dublin, and we have been assured that she is an expert on the antiquities of primitive Irish Christianity whose conclusions can be confidently accepted as trustworthy. She has made a study of early Irish Christian remains all along the west coast from Kerry to Donegal. As an example of her thoroughness we may mention that she visited the old cemetery of Kilbride in Askelane, the upright carved pillar on the sandybanks at Doughmackeown and two similar pillars in the Killeen cemetery as well as the ruined churches at Killeen and Kilgeever. With these remains she compared the remains at Caher. I shall now briefly summarize her account of the stone remains, and her conclusions. Her account of the chapel I have already given. At the back of the chapel she identifies part of the original stone rampart or caher which gives the island its name. This contains a stone chamber, probably a cell originally, similar to the chambers found on other islands off the west Irish coast. It cannot be definitely established whether this rampart existed before the monastery in pagan times or was built later as a protection for the monastery. 0ther traces of the rampart are to be found on the north side of the chapel on the rising ground. The rectangle of stones around the chapel was not part of the original rampart but was constructed at a later date. The stone enclosure west of the chapel was probably a cattle pen, also of later date. There are several tombs in the area around the chapel but no certain conclusion can be drawn from their date. I might say here that I never heard any tradition about burials taking place in the island in modern times. On the other hand it is quite probable that long after the monks had disappeared from the island the people would have regarded it as sacred ground and would have wished to be buried there - as we know to have happened at Clonmacnoise and elsewhere. There is a tradition that a massacre took place there at the time of Graineuaile and this of course would account for some, at least, of the tombs. The most fascinating part of Miss Henry's account is undoubtedly her description of the fourteen carved stones, and the conclusions she draws from them. These are all to be found near the chapel. Some are flat on the ground, either embedded like the Leabaidh Phadraig, or just lying loosely. Others are standing upright and mark some of the stations around which the pilgrims walk in prayer. She gives a brief description of each, listing them A, B, C, etc. She then selects a few for special consideration. Slab "A" is particularly interesting. Standing about thirty inches high, it is decorated on the west side with a large Greek cross in a circle over two dolphins standing upright and facing each other. In early Christian art the dolphin is a common feature. Probably because of the Roman legend that dolphins saved drowning men by bringing them ashore on their backs, the dolphin came to be regarded as the symbol of the Redeemer. We do know that dolphins are easily tamed and that in modern aquaria they show a high degree of animal intelligence and attachment to human beings. They are found on early Scottish sarcophagi and in the Catacombs. Several examples of carved dolphins are found on Scottish slabs of the eighth century. Slab "B" belongs to the type of slab known as pillow stones, which stood at the heads of graves, and are a feature of the early Christian remains of Lindisfarne Island and Hartlepool in the north-east of England. Again Slab "I" is significant as the outline of its cross occurs on some pages of the Book of Lindisfarne. 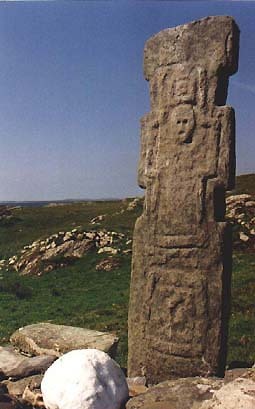 When we recall that a great English ecclesiastical historian, the Venerable Bede, has put it on record that Saint Colman came from Lindisfarne to Bofin after the Synod of Whitby about the middle of the seventh century, it could hardly be a coincidence that these types of carvings are found on this other island in the same area. This conclusion is strengthened by the evidence from Slab “N” [see photo at top of this page]. Standing on the station which is at the highest point of the rocks south of the chapel, it is five feet eight inches tall and is the only slab on the island which is carved on both sides. On one side is a carving of a head without the body, which seems to be intended to represent the Crucifixion. It seems to belong to a class of slabs which archaeologists date from the late seventh century. Slabs of the same general class are found in Duvillaun and Carndonagh. Miss Henry makes an interesting comparison between Slab “D” on Caher which is known traditionally as Leabaidh Phadraigh and a slab in the old graveyard at Killeen and, from the comparison, comes to the conclusion that the carving on the Caher slab represents a chalice rather than a cross. Summing up in the final section of her article, Miss Henry draws some interesting conclusions. First, that there was on the island an early Christian monastic settlement similar to that on Innishmurray. Whether the island was inhabited before the monks settled there, it is impossible to say. As regards the date of the foundation of the monastery, “all that can be said is that, from the character of the carvings and their connection with the Lindisfarne of Saint Colman's time on the one hand, and with the Carndonagh Cross on the other, the slabs can be dated to the seventh century, which we are then justified in considering as the time of the greatest development of the monastery. But it may have existed before this date, and the tradition which connects its foundation with the time of Saint Patrick may not be purely legendary... It seems that in the fifteenth century or thereabouts the chapel which may then have been in ruins was rebuilt." It may interest our readers to know that an Augustinian priest of the English province who visited Caher in recent times, and who has considerable experience in matters archaeological, would date the remains considerably earlier than Miss Henry does. She however is not dogmatic in stating her conclusions and does admit the possibility of an early date for the foundation of the monastery. As regards the tradition that Saint Patrick himself visited Caher, a few facts may be noted. In the early written account of the life of the saint, namely the Tripartite life which dates from about the end of the seventh century, there is an account of his visit to Croagh Patrick. It is stated there that he arrived in Aughagower from whence he went to the top of the Reek which was then called Cruaghan Aigle. There he spent the forty days of Lent (the year is traditionally taken as 440). Coming down from the mountain he celebrated Easter at Aughagower where he set up the son of a local chieftain as bishop, and then he continued his missionary journey. There is no mention of his going west of the Reek. I think that we may reasonably suppose that he may have sent one or more of his followers to evangelise the district west of the Reek and the islands on which he must have looked with admiration so many times during his forty days. If a monastic settlement was set up in Caher as a result of this mission that fact in itself would account for its being regarded as a Patrician foundation. In later years the transition in popular tradition from “Patrician foundation” to an actual visit by Saint Patrick would be an easy and natural development. Perhaps we may be permitted one final piece of speculation. As far as we know there is no evidence from history as to how the monastic settlement on Caher came to an end; nor is it likely that any new evidence will come to light at this stage. While it seems to be generally accepted that the Danes in their raids bypassed the north western counties and concentrated on the Shannon estuary and southwards, yet it is not unlikely that in their first raid along the north west coast they would have visited the islands, especially any island with a monastery where the prospect of getting valuable loot in the form of sacred vessels etc. would be particularly promising. However, these are all matters of opinion and it is not likely that we shall ever be able to give a final and definite answer to these and many other questions that will naturally occur to anyone who takes an interest in the remains of ancient Christian Ireland. Meantime, Caher lies in its ocean home - serene, remote and aloof - a reminder of Ireland's first fervour in the faith, a challenge, perhaps, to our modern materialistic mode of life; ever beckoning to, and inviting, those who would come aside a little while to rest and contemplate and pray.